Queen of the Needle Mouse available separately. In my little kingdom/ of stitches that cross/ I am queen of the needle/ still boss of the floss! The Queen returns in a new format, and she is still in charge of all the stitches and all of the floss. This time the verse (stitched in royal purple, of course) wraps around the panels of an octagonal cube. Each panel is a scene in the Queen’s garden of beautiful flowers where bluebirds, bunnies, butterflies, ladybugs, bees and tiny mice come to play. There are roses, crowns and pink pearls on the top and a turtle giving a mouse a ride on the bottom. 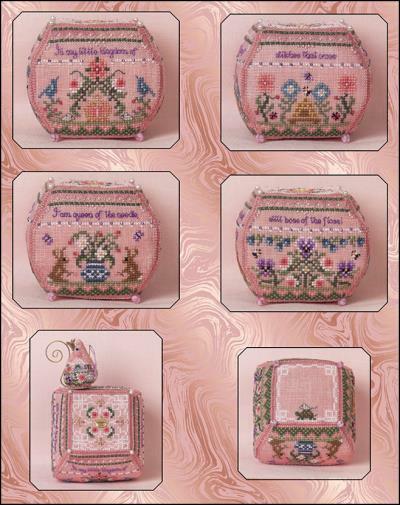 Stitched on 32 CT Weeks Charlotte’s Pink Linen with DMC, Kreinik 3202 #4 Braid and Gentle Art 7035 Tea Rose. 13 ¾”H X 11 ¼” W.
Included are white pearl and lavender hex beads, pink pearls, a gold crown charm for the top, 4 pink and white striped beads for “feet”, cardboard for the base and complete finishing instructions. Stitcher will need to supply heavyweight fusible interfacing, stuffing and optional pearl pins for the top corners. Each side of the cube measures 3” X 3”. Still Queen of the Needle is offered as a Special Edition of 700. Stitcher will need to provide stuffing and a straight pin for the crown. Complete finishing instructions for the mouse are included. 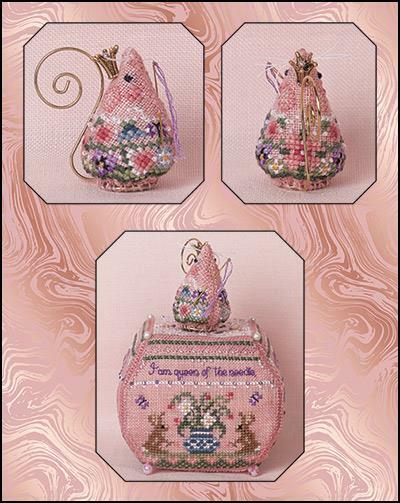 Queen of the Needle Mouse is stitched on 32 CT Weeks Charlotte’s Pink Linen with DMC. Design area is 2” X 3 ½”.